Mountain biking continues to stay one of the most popular forms of bicycling. Many riders enjoy exploring new locations that you would never be able to see if you're just driving by and they enjoy getting away from the traffic and the city. 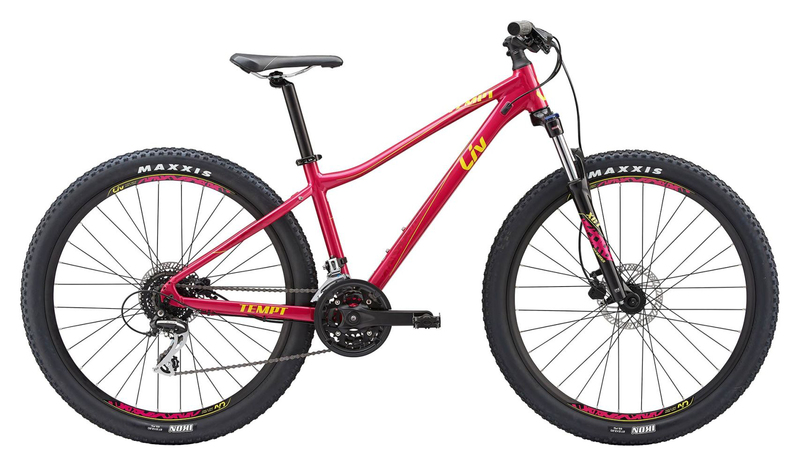 With the 2019 Liv Tempt 3 Bike, you'll be able to enjoy all the singletrack around. It is built with an ALUXX aluminum frame that is designed specifically for women. It has 27.5" wheels that are nimble and roll over rough terrain efficiently. It features 100mm of travel on the front to absorb the big hits and has a lockout so you can climb without the suspension being active. Eyelets on the rear of the frame allow riders to equip the Tempt with a rear rack so you can transform it into a commuter or a light-duty offroad touring bike. With the Shimano Altus 3x8 drivetrain, riders will have an 11-34 tooth cassette combined with a triple chainring crankset on the front for maximum terrain versatility. This means you can climb hills easily and still have gearing to accelerate on the flats and going downhill. Tektro hydraulic disc brakes provide ample stopping power needed to riding the trickier terrain. If you're looking for a great mountain bike that is loaded with features, then you'll want the Liv Tempt 3 Mountain Bike.